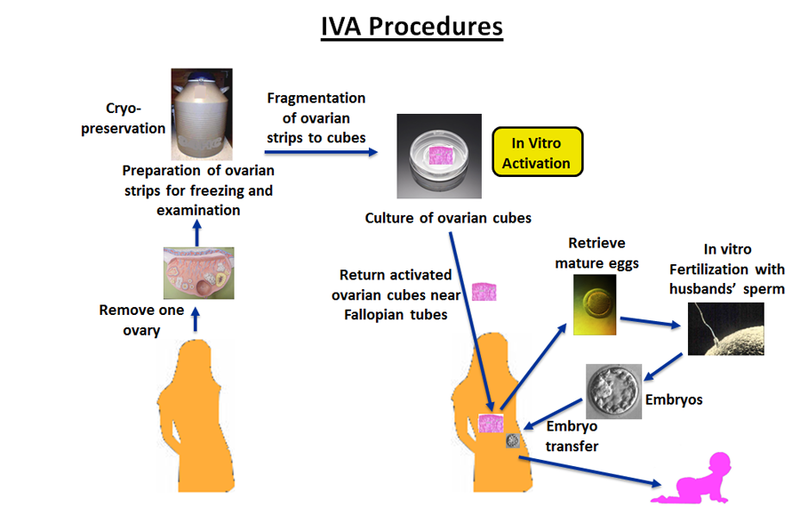 IVA, short for In Vitro Activation, is a new procedure to obtain mature eggs from women in which ovarian pieces are activated outside the body before grafting back to patients. For a pregnancy to take place, one egg from mother needs to be fertilized by sperm from father. Inside women's ovaries, there are many follicles, each containing an egg surrounded by supporting cells. At birth, ovaries contain about 800,000 follicles in girls and, after puberty, one follicle per month reaches the mature stage and releases a mature egg. During a woman's reproductive life, only about 400 follicles reach the mature stage. Because the total number of ovarian follicles in women is fixed at birth, the number of available follicles (or ovarian reserve) decreases with age. Some women experiences 'diminishing ovarian reserve', resulting in infertility. For women suffering from diminishing ovarian reserve and infertility, no mature follicles containing eggs are present. However, some patients still have residual small follicles in their ovaries with the potential to grow into mature ones and release mature eggs, leading to pregnancy. Using the IVA approach, the doctor retrieves one ovary from patients using laparoscopic surgery. Using a miniscule amount of ovarian tissue, the presence of follicles is determined. The majority of ovarian tissues are frozen for later activation. When follicles are detected, the doctor informs the patient and activates the "sleeping" follicles by treating the thawed ovarian tissues with IVA drugs. After two days, ovarian pieces are grafted back to the patient near the oviduct under laparoscopic surgery and follicle growth will be monitored biweekly using ultrasound and serum hormone levels. When follicles reach the mature stage, mature eggs will be retrieved for fertilization with husband's sperm in the laboratory to generate early embryos for freezing. Patient will be treated with hormones to prepare the uterus for embryo implantation. When the uterus is ready for implantation, the doctor will thaw the embryos and transfer them back to the patient for pregnancy.